While we enjoyed a sweet time of repentance, revival, and retreat at the Whisper Gathering, a man I can’t understand slaughtered worshippers at a Jewish synagogue in the name of I-don’t-know-what. I returned home to a Facebook feed filled with justified anger over this wanton act of anti-Semitism and yet another mass murder. This time, it hit close to home. I’m not Jewish, but I love plenty of people who are. 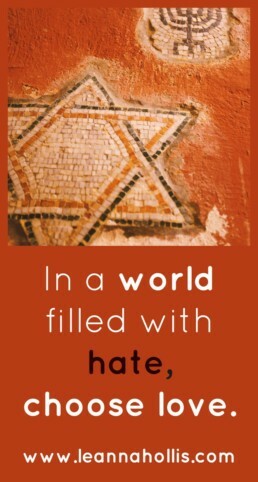 The thought that someone might enter their synagogue and massacre them fills me with horror. I grew up in my grandmother’s home across the street from Mrs. Alice, one of the sweetest women I’ve ever met. Mrs. Alice and my grandmother were great friends. One Jewish and one Christian, those two women talked about religion, recipes, family, and life. They probably disagreed about a few things, including religion, but my staunchly-Southern Baptist grandmother never mentioned it. I don’t know how Mrs. Alice felt about Grandma, but I know Grandma loved her, and I did, too. Mrs. Alice’s granddaughter was one of my friends growing up. We hung out together after school and in the summer. Our group of friends spent time at her home many Saturday nights. We didn’t get together on Friday nights because that was “church time” for the Katz family. No, the Katz family didn’t call it church. They called it synagogue, but, back then, I didn’t see the difference. We didn’t get together on Sunday mornings or evenings either because most of the rest of us had church then. There were lots of different church buildings. The place the Katz family worshiped was just one among many. We didn’t like or dislike anyone based on the building in which they worshiped nor the God they served. Liking and disliking were based on the kind of person you were. Their home was a cool place to be, and we were safe there. Mr. Ralph and Miss Carolyn were two of the most elegant, loving, kind people I’ve ever met. I’ve always wanted to be more like them, but I still have a long way to go. Someone slaughtered people like the Katz family? On purpose? Because of their religion? The terrible deed sickens me. I longed to help in some way, but how do you help in the face of this kind of evil? I wanted to write something heartfelt and moving. Something that could somehow make the hurt and horror better. I worked for weeks to write a blog post sufficient to catch the essence of my Jewish friends’ heartbreak. It took a while to realize I will never speak with their feelings or from their faith perspective. Instead, I’ve decided to try to communicate with mine because it’s what I know. My faith informs every part of my life, just as the faith of my Jewish friends informs every part of their lives. That’s how it should be. Jewish people of America (and of the world) I’m so sorry about the anti-Semitism and hate you’ve endured and the evil done to you. I wish I could undo the great wickedness you’ve experienced, but I can’t. Instead, I offer my deep regret and sorrow, but I recognize it’s a paltry gift. I wish I could promise this kind of evil will never happen again, but, unfortunately, I can’t. I don’t understand why he slaughtered the people in your synagogue. There is no excuse strong enough to justify such wanton destruction. There is no reason sufficient to bring sense to a senseless act of stupid, evil wickedness. No matter your faith background, “Do not murder” seems an extremely reasonable tenet to follow. I’ve seen enough vitriol spewed the last few years to last me more than a lifetime. Enough anger, hate, evil, and killing. We reached the point of “enough” a long time ago, America. I’m angry and disappointed and, in truth, a little disgusted, too. If you don’t think hate-filled thoughts lead to hate-filled speech and, eventually, to hate-filled acts, think again. As a man thinks in his heart, so is he, my scripture tells us. Those words are true, no matter what your religion. It’s time to button our mouths and open our hearts. Feel free to call me a Pollyanna, unrealistic, or spiritually excitable. I’ve heard it all before. The world would be a much better place if there were a good bit more compassion, kindness, and, yes, love—especially for those who are different in some way. Life in the minority isn’t so great. Although I don’t know what it’s like to live my entire life as a minority, I’ve been in the minority more than once. It wasn’t a warm and fuzzy place. In some of those situations, my faith put me in the minority. In a few of the countries I’ve visited, the number of fellow Christians was astonishingly small. It wasn’t always a comfortable situation. I know people who’ve lost homes, jobs, family, finances and had to flee their homeland—all because they’re Christian. Their experience broke my heart. Not long ago, I was denied an opportunity because I’m “too Christian.” It was a surprise to me, but it wouldn’t have been a surprise to some of my Jewish friends, or to my Sikh and Muslim friends. They aren’t shocked when they’re denied because of their faith because it’s not unusual in their world. My LGBT friends aren’t shocked when they’re denied, either. The problem is in our hearts. The world can be a hard, mean place, especially to those in the minority. The problem is not faith or persuasion. The problem is in our hearts, and it is there where true prevention lies. Unfortunately, you can’t legislate morality. We can, however, examine our own hearts. Reach out to those who are different from us in some way. Get to know them. Accept others, despite our differences. Whether we view those differences as right or wrong, they surely aren’t death-worthy. Learn to love – even people who aren’t like us. We can stand up for the underdog, the outcast, the least among us. And we must. It’s okay to disagree with me. I might disagree with someone, but I certainly wouldn’t murder them over a different viewpoint, no matter how closely I hold my own. It’s chilling to realize there are people who wouldn’t mind murdering me because my values don’t match theirs. I’m staunchly Christian. I write about love, prayer, and big faith in a big God who loves everyone. I believe in Jesus, who ate with sinners and loved everyone from liars to thieves to prostitutes. He loved the ultra-religious and those with no religion at all. I pray for terrorists to come to faith in God and turn their lives around because Christians are supposed to love our enemies, do good to those who hate us, bless those who curse us and pray for those who mistreat us. (Luke 6:27-28) If you claim the name of Christian, hating anyone for any reason is not one of your options. There are people who disagree with me. Probably a lot of them. My Jewish friends, my Sikh friends, and my Muslim friends all disagree with me about Jesus. I don’t believe any of them would consider murdering me because of it, nor would I murder them because their faith doesn’t embrace Jesus. I’m conservative and favor a number of conservative causes. There are plenty of people who disagree with me. I’m fine with it. We don’t have to agree about everything, but I’d rather have my love than someone else’s hate any day. The target of radical hate isn’t limited to any particular group. I could easily be the next target. You could be, too. Faith should inform our actions – in a positive way. Chew on that for a few minutes. Do you hold your values closely enough for someone to notice? If you don’t, you should, because what good are values and beliefs that aren’t strong enough to be apparent to those around you? I believe we should take action in response to our beliefs because faith without action is dead. The action we take, however, should be a helping hand, not a bullet in the heart. Hand out new socks to those experiencing homelessness. Help a battered woman get set up in a safe place. Offer a helping hand to someone recently released from prison. I could give you a list of potential actions as long as my arm, but you probably know that because you’ve already helped me with my list. If you’re reading this post, you’re probably similar to me in beliefs, persuasions, and actions. I want to be sure I’ve made something very clear: The Jewish people who were murdered were a lot like me, too. They were good people who valued their faith, enjoyed their community, and invested in the lives of people around them. They did good deeds, celebrated life, and worshipped with their faith community. I’m so sorry for their friends and families who’ve been left to sort out the hate and grieve the loss. I’m ashamed of what so many of us have become in America, once the land of the free and the home of the brave. Hate abounds, but hate brings nothing good to the table. We seem to have forgotten the words memorialized on the Statue of Liberty, from “Colossus,” the poem by Emma Lazarus. The nation who welcomed those in need and those who wanted a safe place for a fresh start has, in some unfortunate ways, become no better than those our immigrants left behind. If we are to welcome “those yearning to breathe free,” we must allow them the freedom to breathe. Anti-everything is alive and well, but it shouldn’t be. Anti-semitism is clearly alive and well in America, and I am appalled by it. Anti-almost-everything is alive and well here, too. Can’t we agree to disagree, whether it’s about religion, politics, or some other hot-button topic, and leave it at that? If you’re not part of our solution, you’re part of the problem. I don’t know who first said that, but it’s worth hearing one more time. Hate doesn’t make anything better. It breeds more hate. More violence. More death. There is an answer to this problem. I’ve offered it over and over again, but I’m nothing if not persistent. Haters, if your god doesn’t love everyone, it might be time to find a new god. I’ll be happy to introduce you to mine. He loves everyone – regardless of skin color, ethnicity, political persuasion, past mistakes, or current religion. I try hard to love that way, too. I’m not perfect at it, but I’m better for the effort. In a world full of chaos, choose peace. Despite an epidemic of violence, choose kindness. Regardless of the predominance of hate, choose love. Should You Love Your Neighbor if You Don’t Like Him? Thank you, Debbie. Your words mean so much to me. I’m so grateful your family was (and still is) a precious part of my life.